Mary Magdalene contemplates a crucifix she holds in her left hand. Her right hand is on her bosom, indicating her love and devotion to Jesus Christ. Her narrow, expressive face, sad gaze and slightly open mouth are framed by long hair that drapes across her back, shoulders and bust. The movement begun by her left foot is softened by a rough, rigid habit of palm fibers that hides this saint´s anatomy. This is one of the finest examples of the realistic language of Spanish Baroque sculpture, steeped in emotion and religiosity. 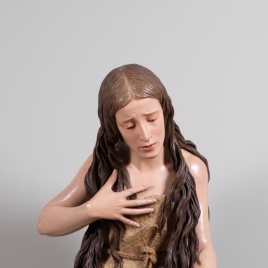 Such representations of Mary Magdalene were enormously popular during the seventeenth century as personifications of the concept of Christian repentance. 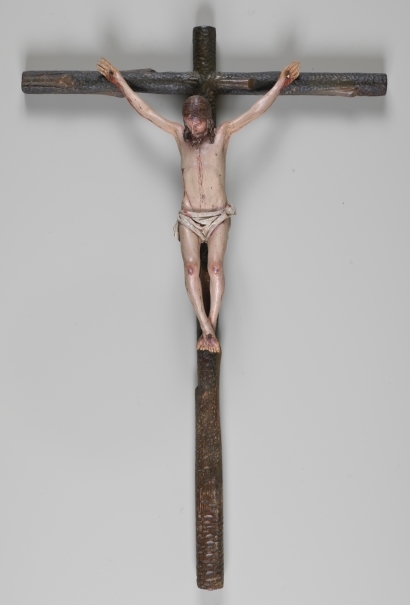 Despite its being an iconography rarely used in the Andalusian school, it was much accepted in Castile, and various similar examples are known. It was made for the casa profesa of the Jesuits in Madrid during a voyage Pedro de Mena made from Granada to the Court in the mid sixteen sixties. Height: 173 cm. ; Width: 55 cm. ; Base/bottom: 97 cm. ; Weight: 35 Kg. Serrano Fatigati, Enrique, Escultura en Madrid, Boletín de la Sociedad Española de Excursiones, XVII, 1909, pp. 215-217. Dielafoy, Marcel, El Arte en España y Portugal, Libreria Gutenberg de Jose Ruiz, Madrid, 1920, pp. 283-285/ lám.511. Pedro de Mena, escultor : homenaje en su tercer centenario :..., Sociedad Económica de Amigos del, Málaga, 1928. Luna y Moreno, Luis, Pedro de Mena y Castilla, Direccion General de Bellas Artes, Valladolid, 1989, pp. 48. Henares Cuellar, I., Pedro de Mena.III Centenario de Su Muerte 1688-1988, Junta de Andalucia, Málaga, 1989. Garrido Pérez, Carmen, Technical examination of Pedro de Mena's Magdalen, Conservation of the Iberian ans Latin American Cultural Heritage. II C. [.Madrid, Septiembre 1992], Londres, 1992, pp. 42-45. Museo Nacional del Prado, Enciclopedia del Museo del Prado, T.F. Editores: Fundación Amigos, Madrid, 2006, pp. 1460,1461. 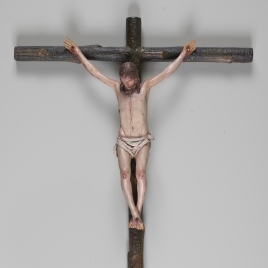 The sacred made real: Spanish painting and sculpture 1600-1700, National Gallery, 2009, pp. 150-155. Bray, Xavier, Lo sagrado hecho real. Pintura y escultura española 1600-1700, 2010, pp. 150-155. Inv. Museo de la Trinidad, Escultura. Núm. 60.